The PetSafe Deluxe Little Dog Bark Control Collar uses PetSafe’s Patented Perfect Bark technology to detect and correct only your dog's bark. 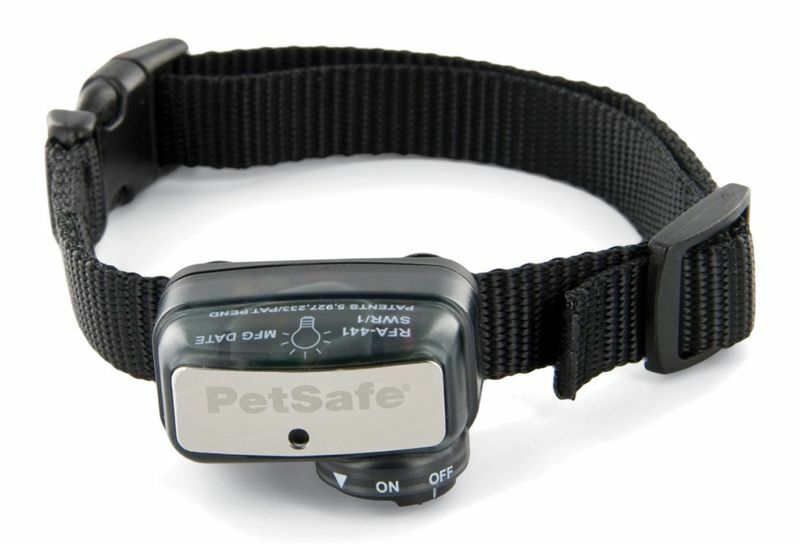 When your dog barks, the collar sends out a safe but annoying static correction. If the dog continues to bark the correction will increase in its intensity. This allows your dog to learn the association of barking with a static correction and will practically eliminate the nuisance noise. This compact design is perfect for dogs up to 55 lbs. and comes with an adjustable collar with fits a neck size up to 16". Includes adjustable collar which fits a neck size of up to 16"
Can be used on dogs up to 55 lbs. Click here - PetSafe Deluxe Small Dog Bark Collar Owner's Manual. WHAT IS NOT COVERED: This non-transferrable limited warranty does not provide protection against, and PetSafe will have no liability under this non-transferrable limited warranty for any damage to or defects in the products caused by any animal, loss of product(s), failure, defect or damage caused by events and situations beyond normal residential exposure conditions, including, but not limited to: commercial use, misuse, abuse, neglect, improper installation or installation not in accordance with PetSafe’s instructions, use of non-PetSafe accessories, impacts of foreign objects, acts of God, abnormal or improper use, improper storage, attempted repair or service by anyone other than PetSafe Customer Service, accident, alteration, defects in or failure of the surface the PetSafe product is installed in or upon, discoloration or other damage caused by pollution, sunlight, other environmental conditions, mold, dirt, mildew, or exposure to harmful chemicals and any other cause not involving manufacturing defects in the PetSafe product. Under no circumstances will PetSafe be liable for any non-PetSafe labor charges or any expenses whatsoever in connection with the removal, repair or installation of either the original or replacement component(s) relative to in-ground fence installation, kennel installation, pet door installation and other permanent, semi-permanent, or fixture type installations on the retail consumer purchaser’s property. MAKING A WARRANTY CLAIM: To obtain warranty service, call the PetSafe Customer Care center. In the United States or Canada, 1-800-732-2677; in Australia, 1800 786 608; in New Zealand, 0800 543 054. Pursuant to this non-transferrable limited warranty, PetSafe will replace the part with a new or refurbished part. This non-transferrable limited warranty will then apply to either the new or refurbished part for the remainder of the original non-transferrable limited warranty period. DISCLAIMERS: Replacement as provided under this non-transferrable limited warranty is the exclusive remedy of the consumer. Neither labor to remove the part nor labor to install the refurbished or replaced part is covered. This non-transferrable limited warranty is in lieu of all other express warranties. PetSafe expressly disclaims and excludes all other warranties, express or implied, including without limitation, the warranties of merchantability and fitness for a particular purpose. PetSafe also disclaims and excludes all liability for incidental, consequential, punitive, direct, indirect, special or any other damages arising out of or connected with the purchase, use or misuse of this product or for the breach of any express or implied warranties or breach of contract or otherwise. Purchaser assumes all risks and liabilities from the use or misuse of this product. PetSafe does not authorize any other person or agent to make any other express or implied warranties. Furthermore, PetSafe will not be liable for any loss, damage or injury resulting from delay in delivery of replacement parts or for any failure by PetSafe to perform covered repair work due to circumstances beyond PetSafe’s control.